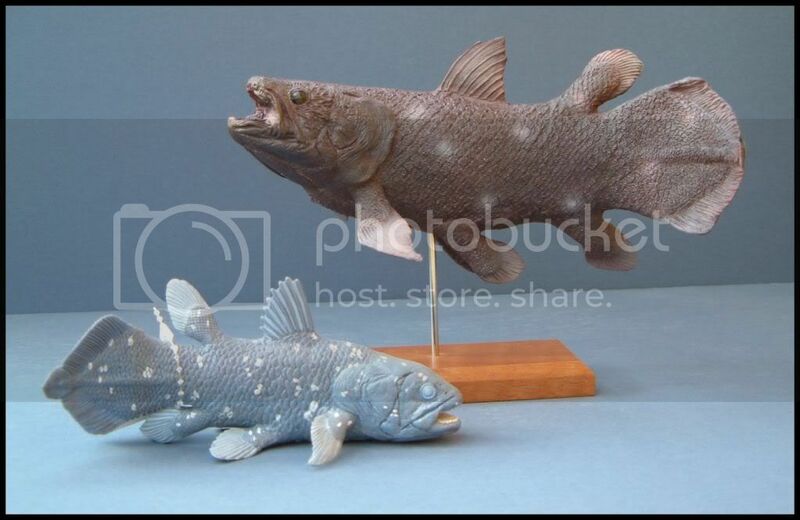 In conjunction with the publication of my “Top Ten Coelacanth Stories of 2011,” and thanks to an inspiration from the Dinosaur Toy Forum, I share with you an overview of the replicas, models, and figurines generally available of the two species of coelacanth (the African, Latimeria chalumnae, and the Indonesian, Latimeria menadoensis). 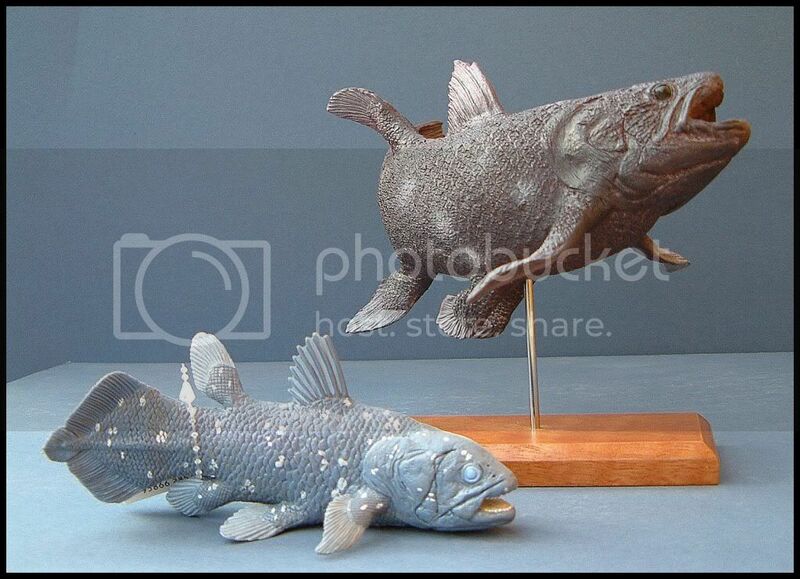 Also, I shall start a gathering here of a few of the museum coelacanth models. Safari, Ltd’s coelacanth is of the African species. Photos (above) by bokisaurus and (below) by Safari. Colorata’s replica (above) is of the Indonesian species, and is approximately the same size as the Safari figure. Photo by bokisaurus. 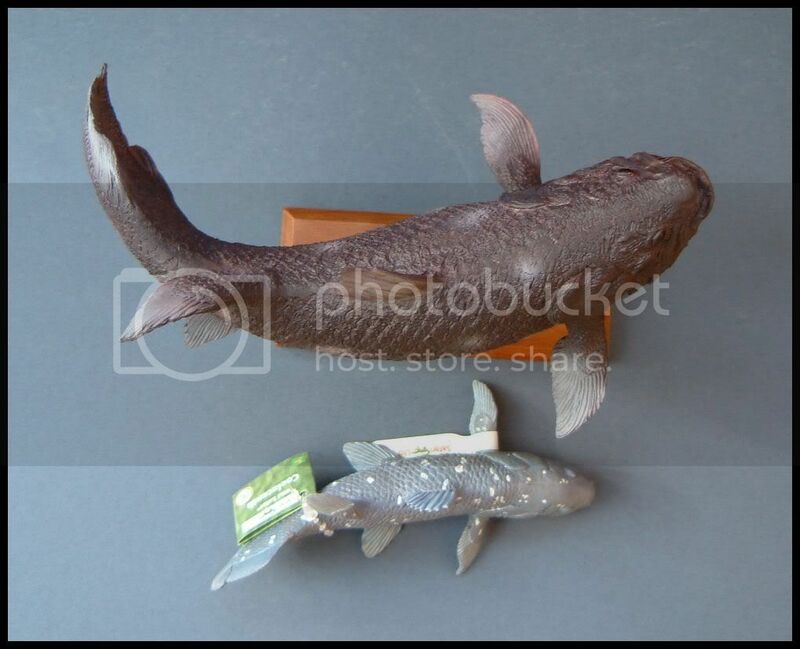 The “Indonesia Coelacanth” replica (above), packaged, front and back, was obtained directly from Japan. Photo by Brent Swancer. The Colorata and Safari replicas (above) of the African and Indonesian coelacanths are displayed here chasing two smaller coelacanths apparently made by Takara Tomy A.R.T.S., but placed on another company’s display bases. Photos by bokisaurus. The very dark Takara company’s coelacanth usually comes with a base that shows the name, as photographed here by sbell. The above coelacanth is one that you make yourself, and is free. You can print it out and assemble it (in paper). For instructions, just click here. Photo by brontodocus. This is the coelacanth from the “Colorata Endangered Species – Fossil Fish” series. It is an older version. Photos (above by brontodocus, and (below) by sbell. The Epoch company’s coelacanth appears to be African. Photo by bokisaurus. This coelacanth is from the Kaiyodo Deep Sea Odyssey Part 2 series. Photo by brontodocus. The blue coelacanth in the back is another Kaiyodo version. Photo by bokisaurus. A collection of coelacanth replicas, photographed by Seijun. Coelacanths are also to be found in museums, of course, in replica form. Here are some examples. This is to be found in an Asian or African museum (exact details lacking). I am moving here the 5.5 ft long full-scale fiberglass replica of the 1938 coelacanth, while re-curating the collection of the International Cryptozoology Museum of Portland, Maine. Photos (above) by Loren Coleman and (below) by John Platt. This smaller model of a coelacanth is to be found in the Oxford University Museum, UK. Photo by Ballista. Primary Source for most replica info: Dinosaur Toy Forum. This entry was posted on Wednesday, December 7th, 2011 at 7:00 am and is filed under Coelacanth, Cryptomundo Exclusive, Cryptotourism, CryptoZoo News, Living Fossils, Replica Cryptia. You can follow responses via our RSS 2.0 feed. You can skip to the end and leave a response. Pinging is not allowed. Here are links to pictures of my Kaiyodo Aqualand Coelacanthe. Absolutely love these fish. Always been my favorite. Great pictures and thanks for the article! Happened to be at the Natural History Museum at Harvard University last weekend. There’s a coelacanth exhibit there, with a partial skull and a full-fish replica.